Recently, however, a fair few friends of mine have been looking to change rooms. 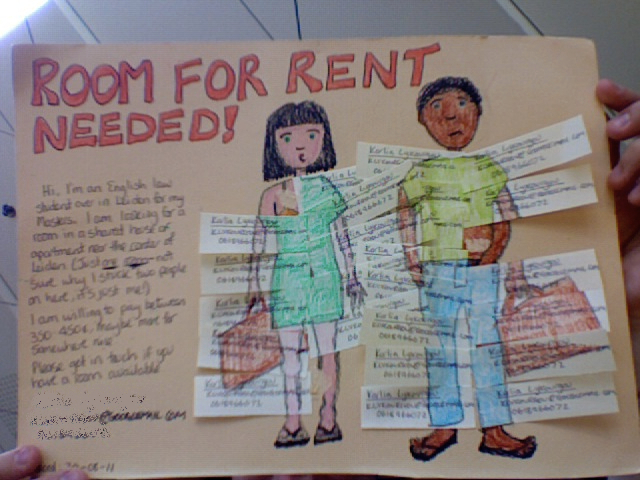 Some have had enough of intolerable housemates, others of cramped and uncomfortable rooms, whilst more still flee from extortionate rents and seemingly never-ending contracts. So, being the helpful chap I am, I started perusing these groups again. I’m almost constantly on facebook (other ‘social networking’ sites are available), to the detriment of my work, but it does mean I’m usually amongst the first to see new adverts, which can be pretty useful. Looking again at these groups, the constant stream of pleas, requiring impossible specifications at impossibly low prices, set me to thinking back to the first couple of weeks I spent in the Netherlands, my life in my increasingly-damp trekking backpack, frantically searching for some place to stay. And this is good because it gives me some basis to nod my head, slowly, sagely, and stroke whatever excuse for a beard I may be sporting, before wisely intoning the ‘golden rule’ – Start looking early. Very early. Not such an earth-shattering revelation that, is it? But somehow it was one I managed to miss. Admittedly, various academic and social commitments had me hopping around Europe for most of July and August, but, given that finding a roof to shelter under is possibly the most important requirement, I definitely didn’t give it enough attention. And my subsequent experience allows me to declare, such as it is, the ‘silver rule’. Get over here, well in advance, and have a look at what’s available. Sure, there’s the internet, that marvellous thing you’re using right now…but let me assure you, 15m2 online and 15m2 in reality are vastly different things. It’s also pretty likely that if the advert says ‘ten minutes walk from the Central Station’, your real estate agent has incredibly long legs or has confused walking with cycling. If you can avoid the agencies (perhaps the ‘bronze rule’), you also avoid agency fees (which, for internationals, can be anything up to three months rent!) but you expose yourself to a greater chance of shady landlords. In my case, I was offered a sublet, possibly too good to be true. And sure enough, on closer investigation, it was too good to be true – the landlord was cheating the system in as many ways as possible plus one, and the potential housemates were perfectly prepared to let me think all was hunky-dory. What of the university accommodation? Don’t they help? Well, they do, but if, like me, you don’t have a sizeable sum to put down as a deposit months before you plan to start your course, you might find the official housing options totally ruled out. If you do happen to have a small fortune lying around, and don’t mind the rather interesting bed-on-top-of-kitchen-and-bathroom en suite layout, then the university accommodation service will be happy to find you somewhere, usually with the promise that it’s amongst the last of the available rooms… Ask for private accommodation and there’s a fair chance you’ll be directed to the commercial wing of the same company that provides uni-linked accommodation. By no means is this a terrible option, especially as you can leave the contract after one semester, but it’s worth being aware of all the other opportunities before plumping for this rather expensive option. So after a week of cycling around in the pouring rain (it was a very wet August, and I’m assured that it was a one-off – we’ll see! ), I finally came across a couple of places I liked, and had managed to find three people who liked the places enough to come live with me. It’s a long way out, but this country is ideal for cycling, and the frequent rain showers that seem to wait until I’ve left the house to appear will drench you just as much on a 5 minute ride as on a 15 minute ride! Others found innovative solutions, like taking on the rooms of Dutch students on study-abroad. As for some reason rents to nationals are much lower than those offered to international students, this is a really good idea. And whilst it’s nice to just make so many Dutch friends out here that you find out immediately when one’s going away, if you do want help, there’s the Roofs Foundation, which occasionally runs out of Plexus, the student service centre, and attempts to find somewhere for you in exchange for a small fee. Whichever option you end up choosing, it’s good to be aware of the alternatives, and don’t rule any of them out completely – even paying an agency fee starts to look good when it’s 7pm the night before term, getting dark, and the heavens are about to open! I’m starting a masters in August/September. I missed out on the University Housing, so I’m in need of a place. 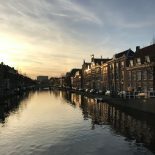 I’ve been having a look online, but is it really much better to just go to Leiden and spend a few days looking around, or is it entirely possible to rent remotely? I suppose if you get a nicer room for less it could justify the cost, but to come for a week from the UK at fairly late notice it’s got to be more than 300euros to come for 5 days or something. Seems a big cost. Most of the places on RooFs are just over the summer, is it possible to rent for a whole year that way? You’re right about the agency fees – I’m keen to avoid those! Some agencies will let you rent remotely, others wont. Even if they do, it’s a risk as descriptions/distances may be quite different in reality. In terms of the costs involved in coming over for a few days, look on the Leiden Housing (https://www.facebook.com/groups/239427083843/) and Housing in Leiden (https://www.facebook.com/groups/40628214075/) facebook pages – they will often have sublet ads up where you might be able to find a place for just a week at a fraction of 300 EUR. RooFs might have places available for a year, but that’s unlikely – more likely is that there will be A room available year-round, just not the same room, so you’d have to move. Also, RooFs is heavily oversubscribed, so demand is high. Best bet – join those two facebook groups and see what happens. I had three or four different possibilities that way (but I’m rather risk-averse and as I had a couple of friends here to stay with initially, I decided only to part with cash on arrival). Good luck. Hi, great blog, very helpful. I’m incredibly late to accept a masters position and haven’t found a place either. A friend has offered my an apartment in Amsterdam for 2 months and I was wondering if you had any advice on the feasibility of living in Amsterdam and commuting to Leiden for studies? I suppose that depends on how often you need to come in to Leiden really, but the social aspect may be more difficult. It’s only half an hour from Amsterdam to Leiden but there’s also the cost of trains to consider. It’s certainly possible but you may get a bit lonely unless you know people in Amsterdam. This entry was posted on January 21, 2012 by admin@theleidener in Laurence.